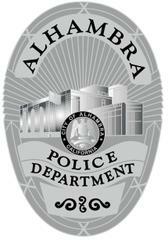 On May 7, 2017, at approximately 5:30 AM, a 2016 Dodge Charger belonging to the Los Angeles County Sheriff’s Department was stolen from the Alhambra Dodge dealership, located at 1100 W. Main St., Alhambra, CA. The vehicle has no exterior markings which would identify it as an emergency vehicle. However, it is equipped with an emergency light package which includes covert red, blue and white strobe lights. It is also equipped with a Los Angeles County Sheriff’s Department radio. There were no weapons or other emergency equipment inside the vehicle. The 2016 Dodge Charger is a black four-door, with chrome factory wheels, bearing California license plate 7MRA998. Alhambra Dodge dealership surveillance video shows an unknown, lone male suspect walk onto the service area, approach the Dodge Charger and drive it away. The Alhambra Police Department has set up a tip-line for anyone that may have information regarding this theft to call. Callers may remain anonymous. The 24 hour tip-line is 626-308-4875. Anyone with information is also asked to contact Det. J. Ng at 626-570-5187. Attached is an image of a similar vehicle to the one that was stolen; NOT ACTUAL VEHICLE (SOURCE: ©Google images).